With the summer holidays in full swing we thought it was time to turn UP the fun at the Brickies Play Centre and launch 5 SUPER SUMMER SESSIONS that will run over 15 funtastic days. You may be reading this and thinking that ALL sessions at Brickies are super, and although that is true, we have decided to pull out the big guns for a final summer showdown! All the below sessions are being exclusively delivered at our Play Centre in Wokingham. We do also have summer events taking place at other venues – check out our Holiday Workshops page for more info. Fossil Finders Stan Studley and Bethany Bricks are deep in the Bricktopian Jungle when they make a discovery of a lifetime! But before they can jump for Jurassic joy their adventure takes a turn for the worse. At Brickies HQ we have been alerted to the dino sized danger and we need YOUR help with the rescue mission. Click on the book now button below and select one of the above dates to book onto this 90 minute session. The land of Ninjago is under attack and with Sensei Wu’s Ninja team close to defeat it is up to the young warriors at Brickies to lead the way and save the day! Forget spinjitzu and airjitzu, we will be teaching our new ninjas the ancient art of BRICKJITZU! Join the Rebel Alliance and defeat the Dark Side as we challenge our younglings to build their own droid to locate the Death Star plans. Then take to the skies in your custom built super starfighter and aim for victory as you join in with the legendary Death Star Trench Run. Even the smallest builder can make the biggest difference. May the bricks be with you. Overworked and underpaid Bruce Wayne has decided to swap his batarangs for boomerangs this summer as he takes a well deserved holiday. Meanwhile in the absence of Batman, Gotham has gone bananas as the Joker, Penguin, Catwoman and many more crafty criminals have escaped from Arkham Asylum. We will be challenging our budding builders to take on the role of Batman as they help Batgirl clear up the mess and restore order to Gotham! The famous explorer Sir Brickaby Jones has discovered all kinds of oddities on his many travels, but never has he encountered creatures like this! 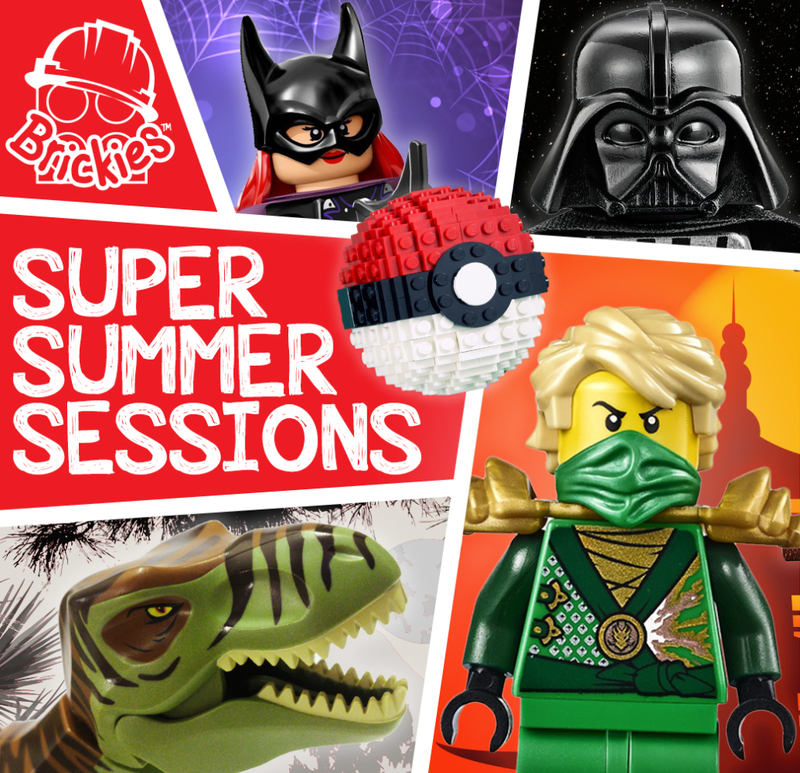 Build, train and battle your own Brickiemon, as you help Sir Brickaby defend the Brickimon’s village…..
Book any three different Super Summer Sessions and receive a free personalised Brickies Lanyard. Book all five of the above Super Summer Sessions and receive a free personalised Brickies Lanyard and your choice of a Brickies T-Shirt or Brickies Cap. Offer only valid on bookings made between Friday 12th August and Saturday 20th August. Claim your Lanyard, T-Shirt or Cap in our Wokingham Play Centre by simply presenting your Super Summer Sessions booking confirmations upon your next visit.